Rock-n-rollers and out-of-controllers, be advised: Hinder is en route to the northern tundra on a mission to “bring the fun back to rock & roll.” Scheduled to play three shows in Wisconsin this winter, they’ll be at The Eagles Club in Milwaukee Dec. 21, the Alliant Energy Center in Madison Feb. 14, and the Resch Center in Green Bay Feb. 19. Partying is what Hinder is all about, in opposition to the name of the band which means “to impede, hamper, delay, prevent, or stop (according to Webster).” A bit of a riddle, the name is the antithesis of the creed of the band, which is unadulterated excess. Don’t waste your time looking for any symbolism. There’s no deep meaning here. No tribal sweat lodge. No mystical dreams about the essence of music or liberation from societal confines. Bassist Mike Rodden describes the unsexy way the name of the band was created: they couldn’t think of a name that everyone could agree on. Someone unearthed a thesaurus, leafed through it until they found the word “frustrated,” which was how everyone was feeling, then ricocheted through the entry ultimately landing on the word “hinder,” which stuck. “Take It to the Limit” is laden with rock anthems that are sure to remind middle-aged rockers of football captain glory days and may serve as a gateway to a resurgence in RATT, AC/DC, KISS, and Guns N Roses sales. With GNR’s “Chinese Democracy,” Motley Crue’s “Saints of Los Angeles,” and AC/DC’s “Black Ice” on store shelves, we might already be there. Winkler’s whiskey-throated voice is impressive, not dissimilar to Steven Tyler’s vocals of Aerosmith fame. Hopefully young people who listen to the album will have sense enough to temper their admiration of the band’s reckless lifestyle with an awareness of the dangers of drug abuse and promiscuity. Hopefully they’ll appreciate the value of creative musical freedom and tap into the Rock & Roll spirit of rattling unnecessary, constrictive convention in pursuit a fuller human experience. 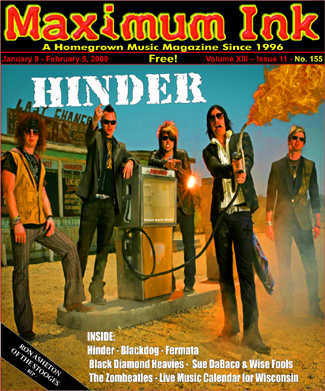 Critics seem to enjoy attacking Hinder, but the general public doesn’t share the hate, as evidenced by their album sales. Perhaps they’re an easy target for attack because their mission is so simple in the face of such complex societal problems, devoid of any extreme introspection or responsible social commentary. They seem to simply ask, “Where’s my guitar, and where’s my beer?” If their main goal is to “bring back the rock of the 80’s,” to “have fun,” and to “purge rock of its 1990’s depression,” then any critical heckling is displaced. Rodden, who graciously received the BMI Best Song of the Year Award in his underwear, momentarily shoved aside America’s burden of an ever-threatening terrorism, a dry-heaving economy, eviscerating political correctness, and emasculating relativism. The filmmakers of Heavy Metal Parking Lot might have a new chapter to film which looks oddly similar to the original, these many years later. Reality is incalculable. If Hinder has their way, we might be this close to the return of the mullet. Say it with me: Business in front, and a party in the back. Or maybe this is a mere flash of thoughtless, highly marketed lunacy while world history churns out a new global epoch. Either way, one can’t help but hold the lighter up when the whole stadium is leaning and humming in the throes of Hinder’s rock anthems, guitar chords shimmering through arena crowds like wind through wheat. In the end, isn’t that what Rock & Roll is all about? To attempt to take life to the very limit of fulfillment by the boundless power of music? They may not be rocket scientists, but at least they know what their mission is: to rock.